We have three dogs that are three different sizes and three different life stages and being able to feed them all the same food and know they are getting what they need is awesome. The service at Great Lakes Pet Food is outstanding. Never having to worry about running out of food with the auto ship program is perfect for our busy life. We started feeding our pup this great food from the start and she loves it! The vet even commented, during her checkup, on how good her stomach felt. She is growing strong! Well Great Lakes definately is true to their word! I was using Great Lakes as recommended by a friends. 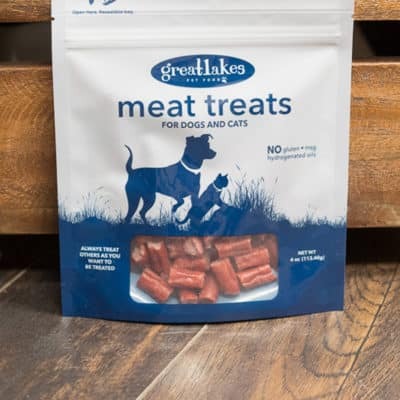 Then I cheated and tried to spend less money on a different brand dog food and my dog kept having loose stool, until I put him back a Great Lakes. What awesome dog food! We still have Maxi on this food and she still cleans her bowl. She has been doing great on this food since she was 6 weeks old and she is not quite two years old. Ships on time, the subscription makes it where we do not have to worry about picking the food up at the store or her running out anytime. Both our Mini Golden Doodle, Yoda & (not so) Mini Whoodle, Zeke, are still excited to receive their bowls of food morning & evening. Expecially Zeke. 🙂 The auto delivery option is also a bonus now that we’ve found our groove with their consumption leveling off. We have feed Great Lakes Grain-Free to our Pomsky since we got her as a pup. There clearly is great nutritional value in this food. She only eats about a cup a day, and is very active. We highly recommend GL pet food. I’ve been feeding the Great Lakes Pork Puppy to my Mini Austrailian Shepherd since March of 2017. She had her 2nd litter 6 weeks ago 6 puppies & I just weighed her today and she still weighs 17# within a couple of ounces of what she weighed before she was pregnant. Her coat is still soft and shiny like her puppies. I started the puppies on the kibble at 4 weeks of age, they are going to town growing. I weighed the puppies today and their weights are 2.5, 3, 3.7, 4.3, 4.5, 5.1 pounds. They doing great eating Great Lakes Pork Puppy food. I have 2 other Aussis’s and between the 3 they eat a 40# bag a month when she isn’t welping. Previously my 17# & 55# Aussie’s were eating 80# of Diamonds Extreme Athlete a month, I thought their coat was shiny before, until I started them on the Great Lakes Pork Puppy Food. Best product I have ever fed to my dogs. PS: The Meat Treats are wonderful also. My adults and puppies love them. Our old man Ringo had been suffering from a few stomach issues in his old age, we had him on several super expensive grain free options, which weren’t making a difference, until someone told me about Great Lakes dog food. I was hessiatant at first as we were used to feeding him kinds of “senior formulas” (he’s 12) His gut issues and skin issues cleared up after a week! We’ve been Great Lakes lovers since! We have been buying this for our Rottweiler, Maxi, for over a year now and she still loves it. 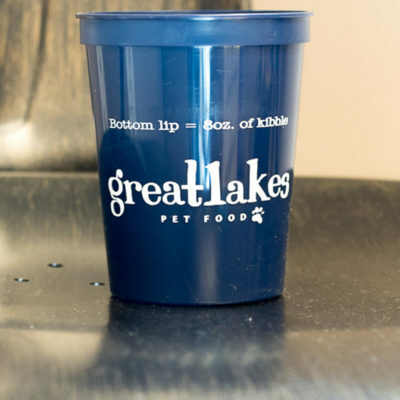 Our Fiona is a finicky eater, and Great Lakes is one food we can feel confident she will eat. Many mealtimes, she cleans her bowl (that almost never happened before we switched to Great Lakes). We have been feeding our puppy this food since we got her. She is healthy, energetic and her coat is so soft. One thing we noticed about this food is that it results in poop that does not stink. Funny story: I was getting ready for work one day, and I needed to go to the laundry room to get some clothes. Unbeknownst to me, Rosie had an accident on the floor. I walked into the room, got what I wanted and proceeded to finish my morning routine. About 20 minutes later, I sat down to eat breakfast and noticed something on my shoe. After closely studying it, I realized it was dog poop. I went back to the laundry room, and there it was, right in the middle of the floor with my food print right in the middle of it. Good thing I was ahead of schedule, I had some floors to clean. My pup hasn’t known anything else besides Great Lakes, so I can’t say much about how it’s affected/benefited him. However, I CAN say that his coat is softer and his bowel movements healthier than other dogs I have owned in the past. He never gets tired of it and the automatic shipping is an added bonus for me. 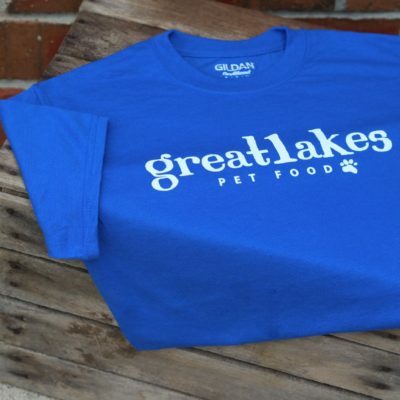 As the owner of Great Lakes Pet Food, I’m not without my own stories. We had 2 poop events within the same week. 1st – We had been gone during the day and our dogs were in their outdoor/indoor kennel. When we arrived home we let the dogs out and one of them made it into the house before she had pooped. We don’t know how many hours the poop was there or how many of us walked by it without noticing, but one thing was for sure, none of us smelled it. 2nd – A few days later I walked through the yard before getting into my truck to head to work. Our puppy still goes in our yard and I stepped in it and didn’t notice. I proceed to drive 20 minutes to work with fresh poo on my shoe and never smelled it! Go into my office and start work and still no one notices until a piece comes off in the hallway and my dad picks it up and realizes it’s poop. 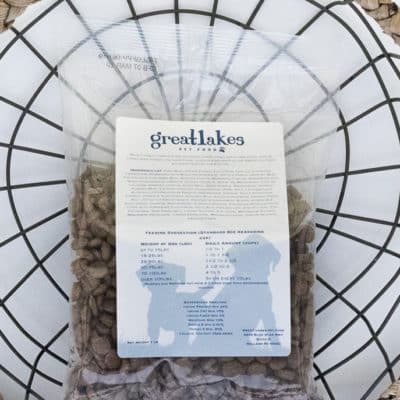 Going on 11 months using the Great Lakes dog food – Maxi still loves it! Always ships on time and can rely on it being there when Maxi runs out! We started our dog on GL kibble from the beginning, which our dog has always loved (so much that we had to buy a slow-down maze bowl). We inherited a large 50lbs bag of another beef-based kibble though, and decided to switch him onto that for a bit so it wouldn’t go to waste. We completely regretted the decision within about three weeks, when our pup started limping on walks and while playing fetch. We took him to the vet where we discovered he was having a bad allergic reaction manifesting as large bumps between his paw pads, that were becoming raw on walks. They mentioned in passing sometimes it’s a diet-based response (we hadn’t even mentioned to the vet switching food), and they prescribed us anti-allergy meds. We tried the anti-allergy meds for a month and nothing improved. Thinking back to the vet’s diet comment, we got some more GL kibble to put him back on the food and his paw issue cleared up in less than two weeks and now he’s happily running all over the place again. We are sticking to GL kibble for good now, and are even switching out his treats to all be pork based! On top of making such a great product, the customer service is also fantastic, understanding when we stopped in the first place, and quickly shipping when we started back on the GL kibble. Thank you! This is the first and only food my dogs have ever eaten. I started them on it as puppies and they love it. I like the fact it is only real ingredients and the staff is great! Our dog loves this food and we have seen some great side effects. She doesn’t eat as much, her coat is softer, and her stool doesn’t smell. She recently had an accident in her kennel and we didn’t even know because there was no smell. Highly recommended. Thank you for your feedback and recommendation. My dog loves Great Lakes dog food. He never has any issues. I love that it gets delivered right to my front door. Our Goldendoodle absolutely loves her GL food after trying several other brand names. Maxi loves the food and the treats! Very dependable shipping and awesome customer service. My Corgi loves this food. I love how quick the shipping is. It is packaged very well. We give a 5-star rating for the dog food! We are extremely pleased with the results we see in our Cairn Terrier’s coat – from wiry/bristly to being super soft. She doesn’t eat as much as she did with other dog foods yet she is content. We tell all our friends with dogs about this food! It’s a quality product!!! Winston our French Bulldog absolutely loves his food from Great Lakes Pet Food. He has allergies to anything with chicken in it and once we switched the constant itching stopped, plus he can’t wait for food time. He is just over a year old and is about 27 pounds and very fit. We have been using since we got our dog Maxi in October 2017. She loves it. Her coat is beautiful and also she doesn’t leave a crumb behind. Would recommend to use the subscription plan – we get on time and don’t have to worry her running out of food or rushing to the store to pick up those huge bags. She loves the treats also! My husband thinks the treats smell good enough for him to eat also lol! Our dog Levi, a 6 month old Goldendoodle, has been on this food since he began eating solid food. He loves it! Would recommend! Excellent food. Pups fight over it…Haha. Their coats are softer on this food than any other I’ve used in-yes-55 years of owning dogs. Ok, so I’m back (from December). The pup (Riley) is 5 months old now. Minnie is 2. Riley eats about 4 cups per day and he’s a tank! Not fat at all, just a big golden…about 50lbs. He’s active so for now, He still eats allot. Minnie on the other hand eats between 2 1/2 to 3 cups per day. It’s hard to be accurate because she leaves food in the bowl and I just add to it. She was eating 4 cups in the first month and a half. We took her for her regular checkup and she actually lost weight! Both dogs have a beautiful coat and white teeth. Still waiting for less poo, but it just started where they are eating less. Crazy. It just started last week that both would leave food in their bowls! AND, if you haven’t let your dog try the meat treats, you’re missing out! Mine love them! Our puppy Maxi loves it. Was suggested to us from the breeder that we bought our dog from and have continued with it. We receive right on time each month. Maxi even received free bag of treats with the last one! She loved them also! Great Lakes Pet Food shipped my order so that we had food the next day (to the east side of Michigan). I had initially planned on transitioning my new pup to different food. However, I waited too long to get new food, and was running low on the food that the breeder sent us home with. Thank you for taking the time to talk to me, as I was brand new to this pet food. I appreciate your knowledge and dedication, and look forward to seeing my puppy grow on this food that he loves. It’s great. Don’t need to eat as much as some to be healthy. Just got a new golden pup who was already eating it when I picked him up. We also have a 2 yr old English Golden who is finicky! Started her on it 3 weeks ago. She picked through the old food for the new food. She loves it! Will post after they have been on it for a couple of months to update on the results. So far, worth every penny! Our corgi aussie puppy mix loves it so much that when we are in a bind, we can use GL kibble as treat substitutes for training. 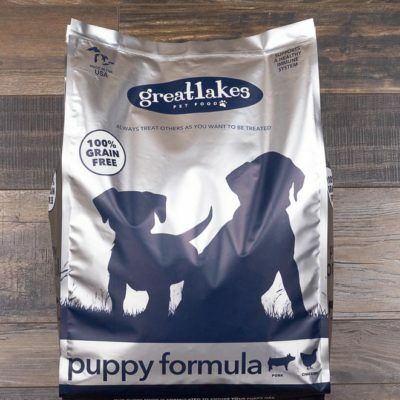 We are so happy with Great Lakes Pet Food since we started on it back in January of 2017. The dogs coats are so nice. There weight is perfect. Plus our overall cost has not increased after changing from a cheaper brand. My dogs are eating about 40 % less food and they are totally satisfied. We are just tickled with the quality of the product and service of this company. Thanks so much GLPF! We love this food for our Auggie! Her coat is so soft. She is so healthy and she absolutely loves her food. She comes running when she hears the food hit her bowl. It feels great to support local business as well, especially one that is superior in their field! We started our Toy Aussie on the Grain-Free Formula a few months ago. It’s amazing how soft and shiny her coat has become. Plus, she loves the food! Have been feeding our Giant Schnauzer / Poodle mix for 3 months now and this is her go to food when other options were available. She would even pick through her food bowl to eat this food and leave the others. We just started “Bodie” our Bernese Mountain Dog on GL pet food. He loves the food, finishes his bowl clean each and everytime. Would recommend anyone to give this product a try. The anatomical makeup of dogs shows that they are carnivores, which is precisely why grain-free is your best option. Great Lakes Pet Food pork formula is formulated for all life stages from puppy to adult. Pork has the highest digestibility of most all protein sources for dogs. This is the reason we started with pork as our first recipe and why it will always remain our foundation formula. Our grain-free pork for all life stages is the best formula for promoting health. If your dog has allergies or sensitivities this formula is especially for you. As with all of our products, this formula is grain-free. It also has no chicken protein. You may notice that it does have chicken fat, and this is because the allergies and sensitivities come from chicken protein not the fat. A Frenchie that eats our pork formula secretly started sneaking into cat food that was grain-free but had chicken protein. He broke out with terrible skin issues resulting in a trip to the vet for treatment. The cat food was placed out of reach on the counter and he went back to only getting the pork formula that includes chicken fat and he since has had no issues. NOTE: The 40lb bag is the BEST value and still offers you FREE SHIPPING. Save $9.95 when you purchase a 40lb bag compared to two 20lb bags! Pork Meal, Potato Flakes, Field Peas, Lentils, Chickpeas, Chicken Fat (Preserved with Mixed Tocopherols), Tapioca Starch, Herring Meal, Egg Product, Flax Seed Meal, Natural Flavor, Menhaden Fish Oil (Preserved with Mixed Tocopherols), Carrots, Celery, Lecithin, Beets, DI-Methionine, Choline Chloride, Parsley, Lettuce, Dried Kelp, Apple Pomace Watercress, Spinach, Pumpkin Meal, L-Lysine, Fructooligosaccharide (FOS), Salt, Lactobacillus Acidophilus Fermentation Product Dehydrated, Taurine, Yucca Schidigera Extract, Vitamin E Supplement, Ascorbic Acid, Niacin Supplement, Organic Dried Kelp, D-Calcium Pantothenate, Riboflavin Supplement, Biotin, Vitamin B12 Supplement, Thiamine Mononitrate, Vitamin A Acetate, Pyridoxine Hydrochloride, Citric Acid, Vitamin D3 Supplement, Folic Acid, Iron Sulfate, Zinc Sulfate, Zinc Proteinate, Iron Proteinate, Copper Sulfate, Zinc Oxide, Manganese Sulfate, Manganese Proteinate, Copper Proteinate, Manganous Oxide, Sodium Selenite, Calcium Iodate. Many pets find higher protein grain free foods to be more satisfying. You may find you can actually feed less of this food with healthy results for your pet. These are quantity suggestions; the amount you feed your pet may vary, depending greatly upon the breed, activity level, metabolism and your preference. We think your pet will enjoy our foods, however; satisfaction is very important to us. We stand by our commitment to provide your pets with superior, palatable food. If when properly introduced, your pet does not like our kibble, return the unused portion (minimum 75%) in the original packaging with the original receipt for a full refund. The return must be within 30 days of the purchase date. If purchased retail, please initially follow the policy of your place of purchase. A Frenchie that eats our pork formula secretly started sneaking into cat food that was grain-free but had chicken protein. He broke out with terrible skin issues resulting in a trip to the vet for treatment. The cat food was placed out of reach on the counter and he went back to only getting the pork formula and he since has had no issues. Quality supplements insure your pet has what it nutritionally needs for health and vitality at all life stages. Chelated minerals possess increased bioavailability and are better absorbed in the digestive system. They may be hard to pronounce, but they are healthy for your pet. For more information, see Frequently Asked Questions.